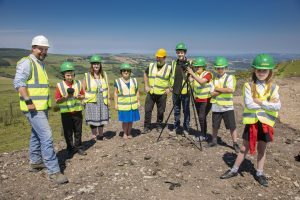 Budding Spielbergs make film to find engineers of the future | News by Wales Express News, People Before Profit! Budding Spielbergs from three Denbighshire primary schools are working with a pop video producer to make a film to promote engineering as a career. The 35 pupils from Ysgol Carreg Emlyn in Clocaenog, Ysgol Bro Elwern in Gwyddelwern and Ysgol Betws Gwerful Goch have teamed up with digital artist and game developer Rob Spaull, whose credits include making a string of videos with rock star Mike Peters. The project is a partnership between locally-based civil engineering company Jones Bros Engineering and the arts service of Denbighshire County Council. It was facilitated by Arts & Business (A&B) Cymru and is being part-funded through the charity’s CultureStep Investment Programme. Partnerships Director, Arts & Business Cymru, Rob Spall, Rhys Roberts, Jones Bros site agent, Elisha Henry, Owain Roberts and Lacey Roberts. The pupils, from years five and six, have been learning about all aspects of film-making – including storyboarding, interviewing, operating a camera, directing and editing. They have even been out filming on location at the site of the Clocaenog and Brenig wind farms where the infrastructure is being built by Jones Bros just 10 miles from company headquarters in Ruthin. Through the project Jones Bros is keen to highlight the wide range of attractive job opportunities available in the engineering industry for men and women. Among the role models is 28-year-old Rhys Roberts, from Glyndyfrdwy, near Corwen, who is a Site Agent on the Brenig and Clocaenog sites. He joined Jones Bros in 2007 when he was offered an apprenticeship after doing work experience with the company while doing his A-levels. Rhys explained: “We were keen to work with these rural schools because a number of our staff members live in these areas. “We are also hoping this will help us create a workforce for the future by attracting more youngsters into the world of engineering. “As a company that prides itself on being an equal opportunities employer, we want to emphasise that engineering is a great career choice for girls and boys. Ruth James, director at Jones Bros, added: “We work closely with communities to help educate about the range of opportunities at companies like Jones Bros.
“This is the third project Arts and Business Cymru have brokered for us. They are able to facilitate opportunities for us to inform young people of the different aspects of our industry in creative ways while also supporting Welsh artists. Rob Spaull, from Colwyn Bay, is giving the young film makers as much responsibility and control as possible. He said: “The idea is that when they see the final film they understand that they were a big part of making it. “In terms of the style of the film, we came up with the idea we would produce something that looks a little bit like a game that everybody is playing at the moment, Fortnite. “We have some drone footage that looks like falling like a parachute and landing on the ground. “We’re also using a GoPro camera fixed to the people’s faces so we’ll have a kind of first person view of what they do in their job. “As a result, it’s action packed and will seem like you’re actually driving the dumper truck or whatever. “Working with the kids is great because they are so inventive. When you give them the space to be creative they can come up with all sorts of fantastic ideas and things that you wouldn’t expect. 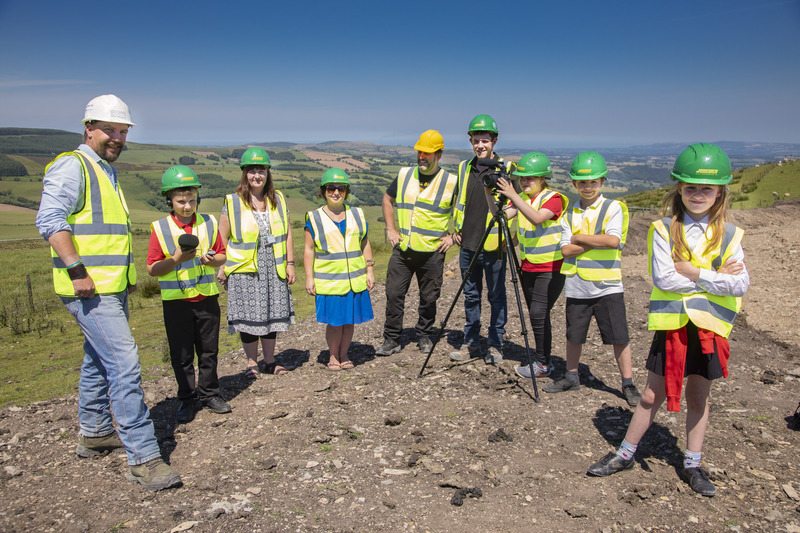 One of the Ysgol Bro Elwern pupils taking part in the location filming was Elisha Henry, 10, who operated the camera when ecologist Dan Cartwright was being interviewed about his job and his role in relation to the wind farms. Equally enthusiastic was classmate Elis Wyn Jones, also 10. Teacher Sioned Hughes, from Ysgol Bro Elwern, is a big fan of the project. It was a sentiment echoed by Sian Fitzgerald, the Community Arts Officer from Denbighshire County Council. She said: “The idea is to show the pupils the very wide range of engineering jobs available in a company like Jones Bros.
“The children are really enjoying themselves and you retain a lot more knowledge when you have different experiences. Gwenno Angharad, North Wales Partnerships Director of A&B Cymru, said: “We are delighted to have instigated this brilliant project and it’s clear the children taking part are getting a huge amount out of it. Details of when and where the film will be premiered are still being finalised. Watch this space!